Angels do not condone violence as a solution, nor do I. Not to say I won’t pop a guy one, with fair warming, if he pushes me too far. I may see angels but I sure ain’t one. Angels simply work in ways that are 5th dimensional and so they show me things in symbolic 3 dimensional ways I can understand and report to you. Or for all I know they’ve added something to the water in LA. I have no idea why I am seeing all this as an ongoing vision for 18 months solid now. And what you see on my blogs is only about 20% of what I see. I could literally write about all this 24/7 and never catch up. A few nights ago I meditated and asked the DreamShield to show me what the angels were up to in the quest for gentle 2012. I was whisked from LA to Chicago, where hundreds of earth angels, dressed like 1930’s mobsters, were shooting up my kinda town! Earth angels zipped through the skies and skyscrapers of the loop, blasting away mercilessly at evil spirits corrupting our legal system and government. Legions of lawyer and judge demon spirits were blown away with the angel Tommy guns blasting bullets of lethal light. I laughed for joy at this unexpected angel work in my adopted home town! On LaSalle Street I watched in wonder as none other that the great Humphery Bogart led a raid on the Federal Reserve Bank of Chicago. “Who the heck are you?” Bogey said spinning on me. “Ken Sheetz, a spirit reporter for the work of a gentle 2012.” I said as I held up my humble Flip camera. “I’m huntin’ demons sucking the life outta Gaia, not regular Joes or dames! Got it? !” said Bogey shouting in my face, not a smart thing to do with my childhood of having a Drill Sargent dad, but I liked what Bogey was up to and let it slide. “Swell. Jimmy give the junior reporter a heater!” Bogey said with relieved chuckle. 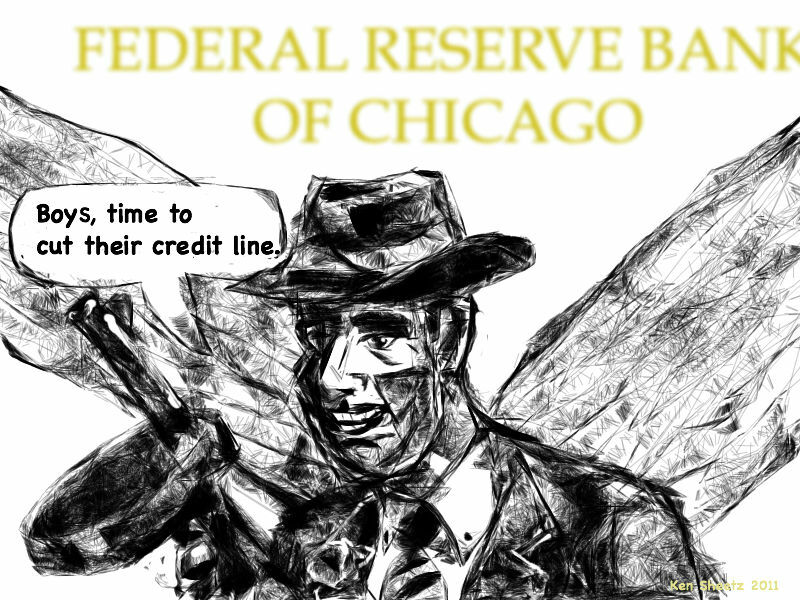 “Ok boys, time to cut the Fed’s credit line!” Bogey shouted. “Kill any demon that moves and the ones that don’t.” added Cagney as the angel gangsters all cheered. Guns blazing, Bogey led our charge into the Federal Reserve lobby. Demon guards drew ray gun pistols that were no match for the angels hail of light bullets. Even your faithful reporter lost all journalistic objectivity and got in demon kills. And before you know it the battle was done, the lobby clear. “Nothing here but a stinking money museum!” Bogey fumed. “How’s about this? ” said Cagney pointing to an armored elevator door locked tight with an electronic keypad. “Try 11 -11-11 as the combo,” I offered. “Do like he says!” Bogey snapped. I counted on my fingers saying, ” 11.11.11 and 11:11 AM and PM. That’s 7 -11s, fourteen ones.” and punched in the numbers. Not an easy task as I thought as the pattern on the keypad kept shifting and the #1 hopped to another spot every couple of seconds. But as I punched in the 14th one, the heavy armored elevator door opened. What we saw was not good however. No elevator, just darkness and showers of sparks where the elevator cab should have been. “Wise guys cut the cords. Gotta make a jump for it.” Bogey said looking down the miles deep shaft filled with dangerous sparking wires. “Well, boys, in for a dime… ” shouted Cagey as he jumped past Bogey into the shaft. The rest of the angel gang followed. “Sheetz, stay behind and watch our backside.” said Bogey jumping into the fray and not giving me time to argue. 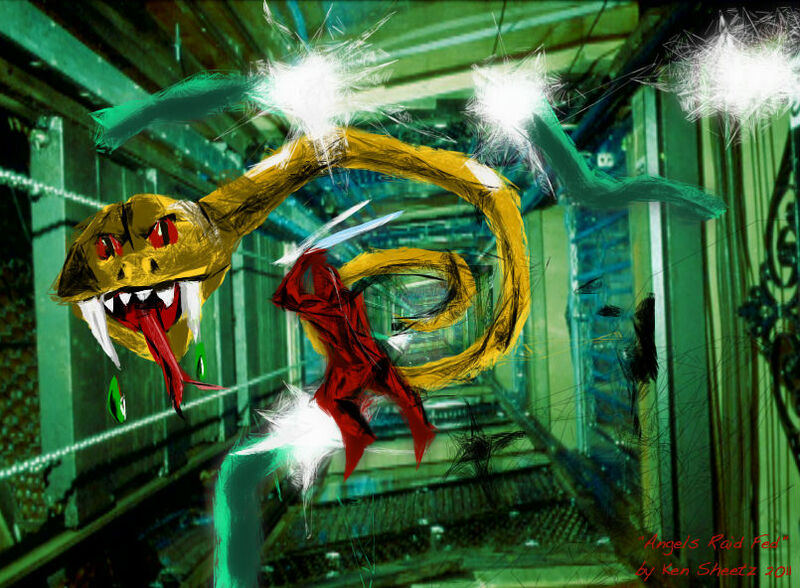 I peered down the scary elevator shaft, filming the brave angels battle slithering snakes of dark energy. Something stunk. I was aware of an evil presence. I spun and looked smack into the face with a giant golden snake. Its pitiless eyes looked right through me with the heartless effectiveness of a credit report. “Stand aside, mortal. 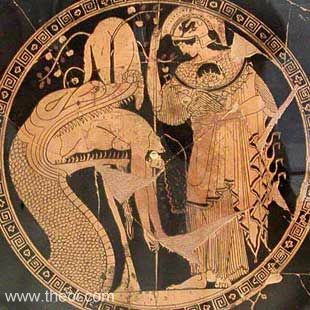 Thisss is not your fight.” the golden snake spoke! I found myself in my boardroom at my Chicago real estate company. My partner and I were laughing as my construction manager sweated bullets. It was 1990, one year before my fall from the easy credit I had ridden to the top of Chicago’s commercial real estate world. We all laughed as the prospective “tenant” and took off her clothes in the middle of our employee’s presentation. The snake was right. I had no comeback and it infuriated me. I drew my sword and switched on my red ethereal armor for battle as we fell for the center of the earth. “Rage is your answer and your undoing!” said the snake as it bit right through my armor. Armor had never failed me and now in over a year of these visions. Poison raced through my veins. The speeding tumble of wires and the laughing gold snake faded. It was 1991, I was in my family room hollering like a crazy man at my wife. Still, she bravely refused to sign the second mortgage papers I shoved in her face, papers that would have given me $250,000 to keep my failing real estate company alive. The golden snake and I hit beam as it bit into my leg, fangs piercing me the bone. As we plumeted for the depths, locked in mortal combat, I saw a fevered parade of all the women I’d somehow hurt in my life, a fiance’, lovers, friends, co-workers, my daughter, my mother, even my Irish grandmother. The snake was right! How could a chauvanist-jerk like me help the angels free Gaia’s heart from the vampire energy of the Fed tapping her dry? “I’ve pumped enough poison into you to kill ten men! Why do you still persissst?” the golden snake hissed, shaking me in its jaws like a limp rag doll. By the freshness that flowed in the dank elevator shaft I knew angels were near. Bogey flew past as he took aim at the great serpent. “Because Sheetz is already dead and now, snake, so are you!” The angels opened fire and the snake vaporized in a hail of angelic fire. 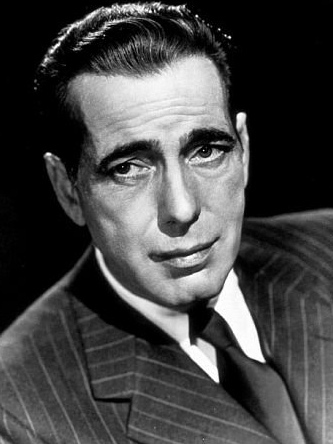 “What did, Bogart, mean I am already dead?” I asked, feeling better already. “Get some sleep now. We got miles left to go. Christ you’re heavy!” Cageny complained as I drifted off. I sat alone on Oak Street beach of Lake Michigan. It was winter 1992. Snowflakes swirled as I stared at the waves. I’d lost everything, my skyscraper, my cars, my company, my wife and kids. I walked into the icy water and kept walking until I was deep beneath the lake and I drowned. I blinked awake in a great cavern, Bogart, Cagney and the angels all about me. “But if I died in 1992 how am I still alive in 2011?,” I said raising my throbbing head. “Are you alive?” chuckled Bogart. “Seems like I am,” I said checking my pulse. 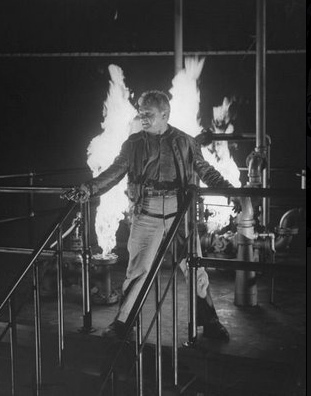 Note Cagney’s wings of flame in the film WHITE HEAT? I saw him blow up the tap to Gaia before finding this amazing still. Bogey pointed to Cagney who was placing dynamite atop the energy tap the fed had to the core Gaia. The tap flowed with her precious blue-white energy to Federal Reserve and World Bank siphons all across the earth. Now an army of snakes rose from the ashes of the old and surrounded Cagney. “Get outta there, Jimmy. We can try this another day!” shouted Bogey. I flashed Cagney the thumbs up as I had him my Flip camera’s view finder. “Made it, Ma! Top of the world!” Cagney shoved down the plunger. The cavern filled with explosions and fire that made hell seem like a picnic. I couldn’t see him, in the smoke and fire, but I heard Bogey shout,”Gaia is free! I rose to full consciousness from my meditation, knowing in some crazy way that what I see the angels doing on another plane of reality helps our world, but wondering if I am in fact a ghost. Your love donations atDreamShield.org at the PayPal link on the page help me report work on the angel visions which, hopefully with your help, I will one day gather into a book.